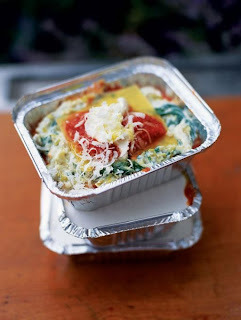 "You can either make this lasagne in 6 individual ovenproof dishes or in 1 large 3-litre ovenproof one. Alternatively, assemble it in 6 individual foil containers, cover with the lids and freeze for up to 3 months. Defrost thoroughly and cook as per the recipe. Tear the mozzarella into small pieces and dot over the top of the lasagne. Sprinkle with the Parmesan. Place on a baking sheet and bake the individual lasagnes for 25–30 minutes or the large one for 45 minutes – they need to be cooked through and golden brown on top".